The arctic fox is very well adapted to the extreme cold of the arctic environment and can be found all around the Arctic. 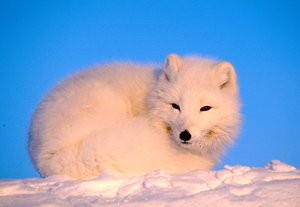 In winter, the Arctic fox is white, but in the summer its coat becomes thinner and changes to a brown and yellow colour. The Arctic fox eats Arctic hares and some birds and bird eggs. But the main source of food is the lemming and the population size fluctuates with the cycle of the lemming population. The conservation status of the species is good, except for the Scandinavian mainland population where it is endangered. The total population estimate in Finland, Norway and Sweden is a mere 120 adult individuals. The main threat to the Arctic fox has historically been hunting, although this has decreased in line with the decline in the fur trade. The Arctic fox remains the single most important terrestrial game species and is still hunted by indigenous peoples. Other threats include diseases and the spread North of the larger and more aggressive red fox (Vulpes vulpes), which has encroached on arctic fox territory in some areas. This is an indirect threat to the arctic fox as a result of climate change. WWF's work in the Arctic region aims to ensure the fragile ecosystems are supported and protected. WWF's work to mitigate the effects of climate change aims to ensure that species such as the Arctic fox are not adversely affected by changes to the climate. Arctic foxes are monogamous, and each pair establishes a territory, or home range, which they use for several years. 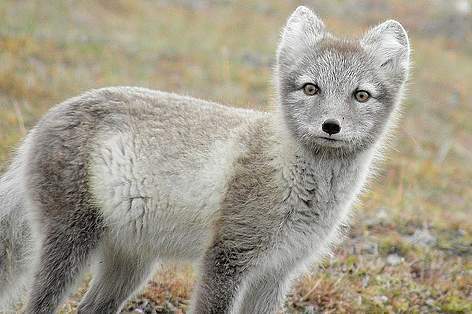 Arctic foxes have more young per litter than any wild mammal in the world.